It's the great pumpkin, Sam Winchester. made द्वारा me :). 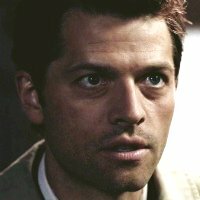 Images in the Castiel club tagged: supernatural season 4 it's the great pumpkin sam winchester castiel misha collins. This Castiel icon contains चित्र, headshot, closeup, हेडशॉट, and क्लोज़अप. There might also be ऐडवोकेट, न्यायाधीश वकील, जज एडवोकेट, and बिजनेस सूट.